When God created the horse, he said to the magnificent creature: I have made thee as no other. All the treasures of the earth shall lie between thy eyes. Thou shalt cast thy enemies between thy hooves, but thou shalt carry my friends upon they back. Thy saddle shall be the seat of prayers to me. And thou fly without any wings, and conquer without any sword. It’s all about love and passion. Well everyone involved with Arabian horses will tell it to you… They embodies beauty, fascination, emotion and obsession! My breeding program tries to produce Arabian horses that are very typey and exotic but also who can be use in various disciplines, in this permanent quest of versatility we chose our first mare Monmoransi *1995-2005 from Nikel out of Magnitka. A dream coming true. 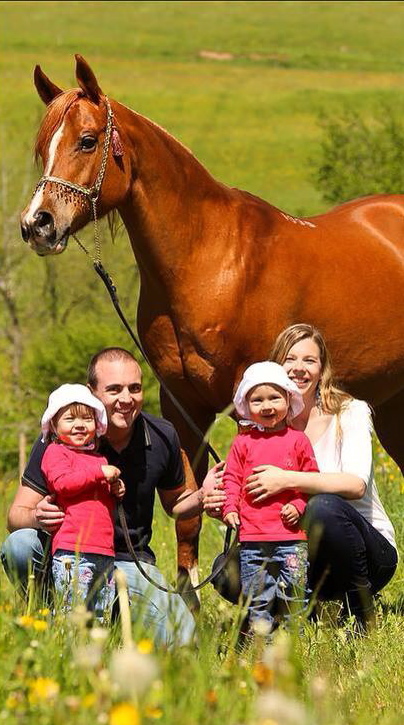 She was awarded as ELITE by the Swiss Arab Horse Association. Her half-sister Misteria by Balaton is the queen in our stud! My horse of a Lifetime! Look at our homebred horses section so you’ll see what we’ve done so far but we expect to achieve so much more in the near future! I’m lucky enough to live my dream. I just try to create special horses that can help you to achieve your highest goals whatever your favorite discipline is. Thanks for visiting this website and for reading this endless story! Hope to meet you one day; visitors are always welcome to the farm. Look at our contact info to find us and hope you’ll enjoy the complete virtual tour of my little piece of heaven.